Located just south of Toledo on SR 24 along the Maumee River is the Providence Metropark that features an authentic canal experience for visitors. Experience canal life on the Miami and Erie Canal circa 1877. Providence Metropark is located in what was once the canal town of Providence, Ohio. More than a mile of the original Miami and Erie Canal and towpath of been faithfully restored and in operating condition including the authentic Lock #44. 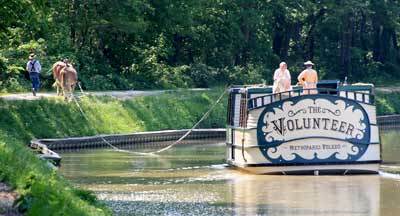 The 60' long canal boat The Volunteer, is a replica packet boat commonly used on the canals to transport passengers. 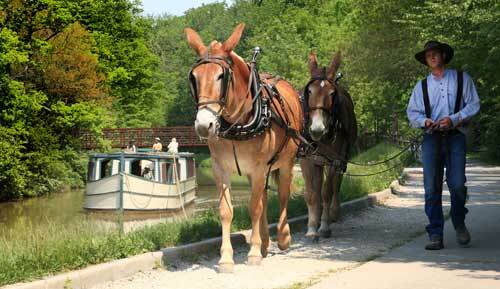 Visitors can take a 45-minute trip along the restored stretch of the Miami and Erie Canal, pulled by 2 mules along the towpath with a crew dressed in period attire for a truly authentic experience including passing through an original lock. Lock #44 is one of the last functioning 19th Century limestone locks and a fine example of typical locks found along both the Miami & Erie and the Erie & Ohio Canals. Lock No. 44 was located 220 miles from Cincinnati to the south and 30 miles from Toledo to the north. Along the canal is the Isaac Ludwig Mill that was both a gristmill and sawmill that began operation in 1866 at the same site. Today the mill houses a variety of working equipment that would have been used over the years of operation. 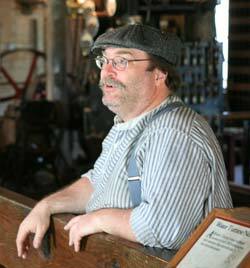 Visitors can see up close the actual working of the saw mill and gristmill that is all powered by a water turbine. 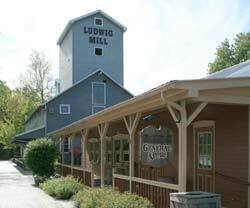 Visitors to the Isaac Ludwig Mill have a unique opportunity to see antique milling equipment in operation. Staff and volunteers gladly demonstrate the workings of using waterpower to grind grain and saw lumber. Also on location are a number of artisans demonstrating heritage crafts such as blacksmithing, tinsmithing and candle making. You can also purchase stone-ground products made at the mill, in the General Store. Next door to the mill is the General Store that has a number of items for sale including many of the heritage crafts. In the spring of 1795, Peter Manor arrived in the Maumee Valley where he traded with the local Ottawa Indians. When the Ottawa's were removed from the area and sent to the Kansas Territory, he was deeded 640 acres. On this land that overlooked the rapids, Peter Manor built a sawmill and platted the town of Providence on the west side of the Maumee River. Manor's original mill stood exactly in the path of the new Miami and Erie Canal. In exchange for the land, Peter bargained with the state for perpetual water rights in exchange for tearing down his original mill to make way for the new canal. When the Miami and Erie Canal was completed through this area in 1839, Providence was a boomtown. At its peak, Providence had 5 hotels, numerous saloons and warehouses, plus a bustling wharf along the Maumee River. The residents were mostly farmers, laborers, quarrymen or dockworkers. There was another side to Providence however. Known throughout the state, Providence was infamous for the drinking, brawling and gambling canallers that also inhabited the town. In 1846 a massive fire destroyed many of the buildings in Providence and in 1854 a cholera epidemic left the village nearly deserted. The Isaac Ludwig Mill, a church and Manor house located west of the mill are all that remain of the original village. On the east side of the Maumee River from where Providence was located is the village of Grand Rapids. Visitors to Grand Rapids are able to step back in time and enjoy the natural setting of this restored canal town. The town was originally called Gilead and was founded in 1833. The town was overshadowed for a number of years by the village of Providence. With the decline of Providence, Gilead began to prosper. The name was changed in 1868 and 10 years later a railroad line was built through the town making it a center for farmers working the surrounding land..
Just south of the village is the Mary Jane Thurston State Park and Marina. Named for Mary Jane Thurston who pastured cows along the river, and later donated 14 acres to create the park. The State Park is now is 555 acres of land along 20 miles of the Maumee River.